Kristopher Larsen, adopted from a Vietnamese orphanage four decades ago, was serving a prison sentence for kidnapping when learned he wasn't an American citizen. Now Larsen -- one of thousands of foreign nationals adopted by American parents who did not follow through on naturalization -- faces deportation. Larsen was 4-years-old when was adopted by an American military family in 1975, and with the imminent end of the Vietnam War, President Gerald Ford ordered the evacuation of Vietnamese orphans during a mission known as Operation Babylift. After his adoption, he was raised in what he called “an all American family” in Guam and Alaska. Larsen sounds American. He looks Asian-American. He had a Social Security number and a Green card. He attended the University of Alaska Anchorage and embarked on an IT career. In time, he married, had two children and moved to Seattle, Washington in the northwestern U.S.
“At one time, I had everything I could possibly want,” he said. “It kind of drove me over the deep end … and I decided that I would have a suicide by cop," he said, referring to the practice of creating a disturbance and antagonizing police into shooting them. "I did that by kidnapping” a 9-year-old girl, according to documents and local reports. He called her parents to demand money. Instead, he was arrested, convicted, and sentenced to 12 years in prison for what he told local press at the time was one of the most "cold and heartless crimes imaginable." Larsen was well into his sentence, teaching mathematics and Japanese to other inmates, when U.S. Immigration and Customs Enforcement (ICE) found him. Larsen was moved from state prison to an ICE detention center. “My family was like, ‘You're adopted. You’re a citizen. You’ve been in our family since '75,’” he said. His parents had just assumed that adoption made him a citizen. But to the American government, Larsen was a Vietnamese national considered legally undocumented with a criminal record. He found it baffling. Since the 1940s, some 350,000 children have been adopted from overseas by U.S. citizens, according to Becky Belcore, co-director of the Korean American Resource and Cultural Center (NAKASEC), which runs the Adoptee Rights Campaign. Belcore says the burden to secure the children’s American naturalization rested on adoptive parents, which is why, in 2001, Congress passed a law giving automatic citizenship to adoptees from other countries. The legislation, however, only applies to people born after 1983 –- too late for Larsen and some 35,000 other adoptees, most of them without criminal backgrounds. Before the law, parents often did not know the burden rested on them to see that their adopted children became citizens. “Or they knew, but the process was so expensive and so cumbersome and they had already gone through an extensive and expensive adoption process they just didn’t do it. … Or that adoptees had been placed in abusive houses, so their adoptive parents just didn’t do it,” Belcore said. “And they sometimes don’t find out until they apply for a public benefit, get a home or student loan … or they get placed in deportation proceedings” after going through the criminal justice system. To fill in the loophole, the Adoptee Rights Campaign is promoting the Adoptee Citizenship Act. The bill stalled in Congress during the election last year, because, Belcore says, no one wanted to touch anything immigration related. But advocates are working to reintroduce it. Larsen served his term in detention and was released in 2015. But the deportation order stands. Larsen could easily be deported, if Vietnam would take him back. At the moment, the U.S. does not have an applicable repatriation agreement with Vietnam. In a 2008 agreement, Vietnam only agreed to take back citizens who came to the U.S. after 1995. But that could change. President Donald Trump has targeted so-called “recalcitrant” countries in his January 25 executive order, “Enhancing Public Safety in the Interior of the United States,” calling on the Secretary of State to impose “consequences” on countries that refuse to take their nationals back. These consequences range from formal diplomatic communications to visa sanctions, ICE told VOA. ICE declined to supply VOA with a list of recalcitrant countries. But as of May 6, ICE says, there were 8,534 Vietnamese nationals with final orders of removal. Since his release, Larsen has been required to show up for regular check-ins, and he has done so, according to ICE. 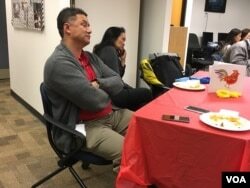 He works at the nonprofit Urban League of Metropolitan Seattle and spoke to VOA from their headquarters. But “now I’m stuck. I can’t leave U.S. soil. So even if I wanted to visit my family in Guam, I couldn’t do that because I would be crossing international lines."